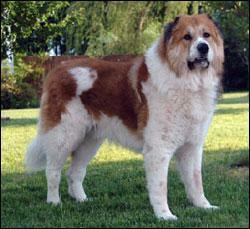 Caucasian Mountain Dogs, also called Caucasian Ovtcharka, emerged from the Caucasus Mountain area. They are a very large dog breed. They were in the past used as Soviet Government as guard dogs to guard factories and government facilities and in the present are used to guard villages and flocks. They are a favorite in Georgia, Armenia, Azerbaijan, Afghanistan, Turkey, and Southern Russia; whereas in United States they have earned the rank of a reliable service dog. Caucasian Mountain dogs are believed not to suffer from any health problems and dog disease and have a life expectancy of 10 to 11 years.